At LinkedIn, Kafka is the de-facto messaging platform that powers diverse sets of geographically-distributed applications at scale. Examples include our distributed NoSQL store (Espresso), stream processing framework (Samza), monitoring infrastructure (InGraphs), and derived data serving platform (Venice). Given these use cases, it’s not surprising that Kafka usage at LinkedIn has grown exponentially. Recent production figures show that Kafka is handling around 4.5 trillion messages/day, with over 2,000 Kafka brokers. Given the scale at which Kafka is operating at LinkedIn, the underlying hardware is really put to the test. Kafka distribution ships with scripts to assist with basic operations on the cluster, such as broker-removal and partition-movement. However, advanced operations, including rebalancing the cluster, were not available in the basic distribution. So, over the last several years, LinkedIn has created and open sourced Kafka Tools that help automate and also manage Kafka clusters, up to a certain level. As the usage of Kafka has grown at an unprecedented rate, the number of operational issues has also increased. Therefore, in August 2017, we open sourced Kafka Cruise Control to handle the large-scale operational challenges with running Kafka. As Cruise Control has evolved from its creation in mid-2017, we have added a REST interface to help with the administration of Kafka clusters remotely. 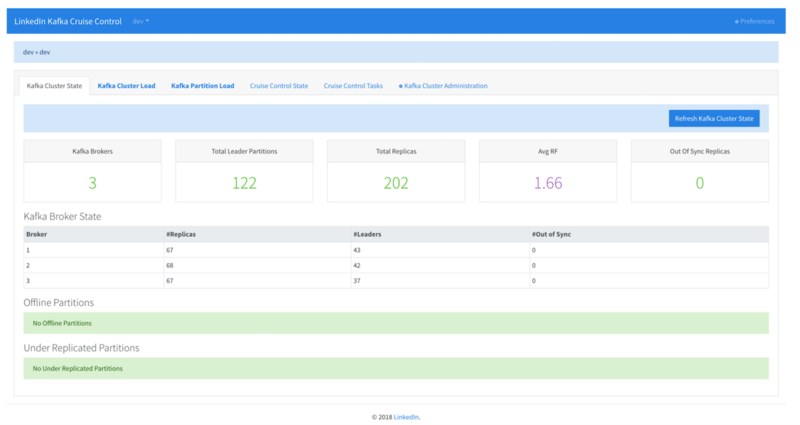 As more and more Cruise Control instances have been deployed, we felt the need to have a centralized dashboard to operate and check the status of any Kafka cluster at LinkedIn. For this reason, we’re excited to announce today our latest open source Kafka tool, Cruise Control Frontend (CCFE). 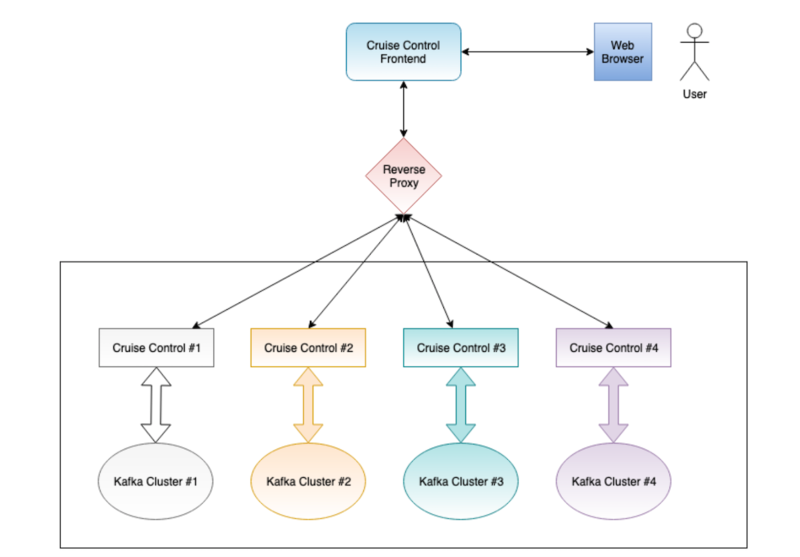 At LinkedIn, Cruise Control has simplified Kafka cluster management. However, the Cruise Control REST API is very powerful, with many features to play around with, and this can be overwhelming to beginners. Given the distributed nature of both Kafka clusters and the teams who operate them, it was a challenge to keep everyone on the same page. CCFE has been created by the streaming SREs to address these above challenges. CCFE is a Single Page Web Application that can be deployed with either Cruise Control or any standard webserver. Details about the clusters to be managed are made available via a simple configuration file. Central dashboard: Go-to place for managing all Kafka clusters in the organization. Dry-run by default: To ensure that a certain action is intended, all requests to Cruise Control (CC) are made in dry-run mode by default. Expensive operations: Some CC features, such as rebalancing, are expensive and depend on the cluster load; therefore, these features are highlighted in a bold color on the UI. API flags: The REST API exposed by CC has conflicting flags when passed as part of the URL. It requires some experience to understand which are conflicting, so in CCFE, the UI takes care of these flags by showing only the relevant ones for a chosen action. Exception responses: User can choose to see full stack traces or partial ones on the UI. Async response: When a request cannot be served within a given time limit, CC automatically converts the request to async and sends the progress data back. Show/Hide URL: Toggle the URL display in every tab to see where the request is being made from the application. Preferences: Allows users to show/hide advanced features on the UI. Cruise Control status: Displays the CC internal status, which includes details of Monitor, Executor, Analyzer, and Anomaly Detector components. Kafka cluster load: Displays the Kafka cluster load, which includes broker- and host-level metrics. Partition resource utilization: Displays the resource (Network In/Out, CPU, Disk) utilization for the partitions in the cluster. Partition state: Displays the leaders/followers/out-of-sync replica details on each broker in the cluster. Replica state: Displays the leaders/followers/in-sync/out-of-sync replica information for online/offline/under-replicated partitions. Optimization proposals: Displays the optimization proposals generated based on the workload model. Cruise Control tasks: Displays the history of tasks submitted to CC, along with their status. Add brokers to cluster: Allows movement of replicas only to new brokers. Remove brokers from cluster: Allows removal of brokers from the cluster. This doesn't allow movement of replicas in the remaining brokers. Demote broker from cluster: Remove the leadership of all replicas owned by the selected broker(s), and if requested so, make them the least-preferred replica for leadership election within their corresponding partitions. 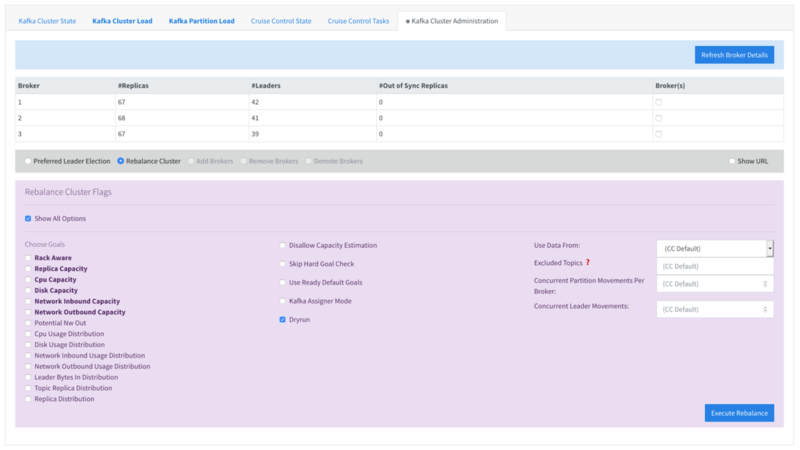 Rebalance cluster: Performs cluster rebalance according to the default workload or user-selected parameters. Stop executions: Stops ongoing add/remove/demote brokers, rebalance on the cluster. Fix offline replicas: Identify and relocate offline replicas to healthy disks on alive brokers. Let’s take a closer look at some of these features. This screen gives a quick summary of the selected Kafka cluster's status. We can get details about the number of Kafka brokers, total leader partitions, total replicas, average replication factor, out-of-sync replicas, and a detailed view of each broker in the Kafka cluster, along with details about offline partitions, under-replicated partitions, and offline log directories. Cruise Control internally leverages the metrics exported by the brokers and computes the resource usage (e.g., CPU, network, and disk), which is further exposed via REST API. On this page, shown in the image below, we can see the computed load from both the broker and server perspective. This is helpful to understand Kafka server and broker performance metrics. In addition to the resource details provided by Cruise Control, several other metrics, like leader-to-follower ratio and input/output ratio, are displayed to get a clear picture of the message patterns on the brokers. This is the place where we can perform all administrative activities on Kafka clusters, such as: PLE (preferred leader election), Kafka cluster rebalance, add/remove/demote brokers, and fix offline replicas. In the case of advanced users, all supported operations of the REST API are also displayed as different UI controls (along with their conflicting behaviors). Preferences allows users to view advanced exception responses in every tab; to view the REST endpoint that’s used for communication in every tab; and to show/hide the list of available tabs. The UI is designed in such a way that each top-level feature is shown as a tab. Both Cruise Control and CCFE have built-in support for leveraging CORS to manage the Kafka clusters. In this setup, CCFE is served from a standalone webserver, and all the requests related to managing Kafka clusters are made directly to Cruise Control. This architecture is recommended for environments where end-to-end encryption is present in the network and Cruise Control servers are protected from unwanted traffic by using a firewall. As of writing, SSL/TLS support for Cruise Control is a work in progress. For more details, see these authentication-support and ssl support tickets on GitHub. Kafka usage at LinkedIn has grown at an unprecedented rate and so have the operational challenges. During the course of Kafka's evolution, LinkedIn has created and open sourced tools like Kafka Monitor, Kafka Tools, and Burrow that provide insight into Kafka clusters. Along the same lines, Cruise Control has been built and made open source, providing a unique system to automatically manage Kafka clusters. Continuing the same trend, Cruise Control Frontend has been built to address challenges with running distributed teams and Kafka clusters. CCFE leverages the Cruise Control API to operate on Kafka clusters and act as a central dashboard for the entire Kafka ecosystem. 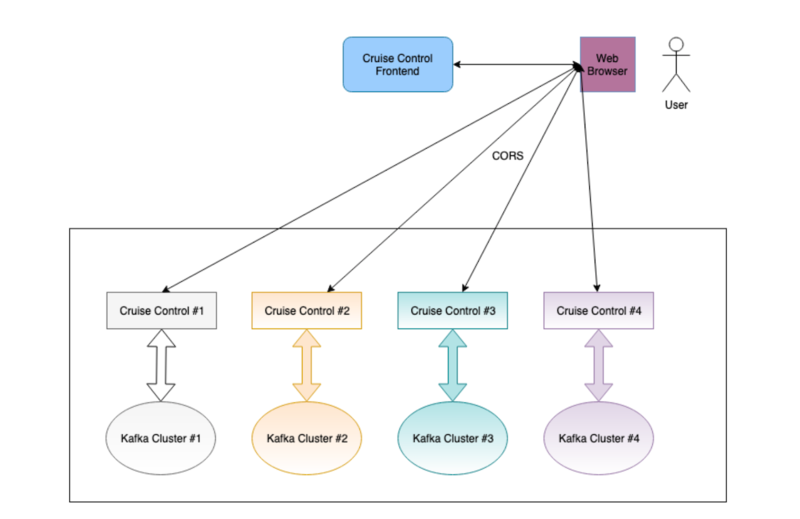 Cruise Control Frontend is the go-to application in the Kafka ecosystem at LinkedIn, which we are very happy to make available to the open source community. 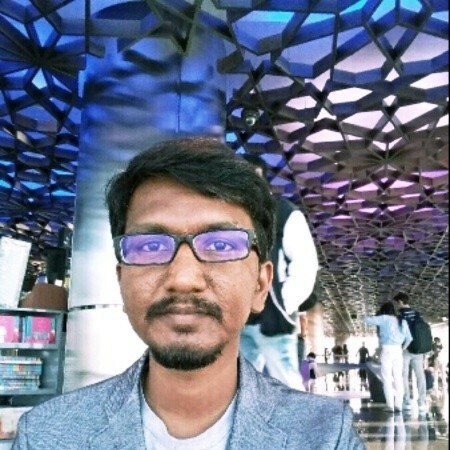 The Data Streaming Team at LinkedIn has been very helpful in designing and implementing both the Cruise Control and CCFE applications to address the large-scale operational challenges with Kafka deployments. This work is not possible without their help. We also would like to thank the open source community on GitHub for providing feedback to improve the Cruise Control project.